Coming up quickly is the fifth annual edition of Manufacturing Day, October 7, 2016, meant to inspire the next generation of manufacturers. Hundreds of industry-leading organizations will do their part to promote careers in manufacturing to students, community leaders and others. Companies joining the Manufacturing Day celebration can host plant tours and informational sessions, to spread the word about the exciting and rewarding opportunities that exist for the next generation of workers in our industry. Other options including organizing or participating in manufacturing-related community events that include several companies; and conducting job fairs and educational fairs. This is your chance to address common misperceptions about manufacturing, and connect with future generations to help ensure the ongoing prosperity not just of your company, but of the entire industry. Start with a visit to the Manufacturing Day website: www.mfgday.com. Among the PMA member companies already hatching plans to participate in Manufacturing Day 2016: Ace Clearwater, Dayton Lamina, Keats Manufacturing, McGregor Metalworking Companies, Marion Manufacturing Company, Pentaflex, Wolverine Coil Spring, Enterprise Tool & Die and Dayton Rogers. Finally, PMA and the PMA Educational Foundation are preparing to assist metalforming companies interested in hosting plant tours and events by providing a resource kit. Available early in September, the kit will include a video highlighting career opportunities in the metalforming industry, and information on educational and career opportunities in manufacturing. For more information, contact Christie Carmigiano. Safety training can have a dramatic impact on the success of your effort to reduce work related injuries. Is your Safety Training Program in line with the White Paper's recommendations? Make it Metal and Win! Ever have an idea pop into your head about what you would make with a 3D metal printer? Maybe you want to make a championship ring for your team or the beer tap of your dreams, anything you can think of we want to know! One lucky person will be selected, by us, to win a $100 Amazon Gift Card! Enter today! This blog post from Andy Henderson, a GE industry analyst, provides a vision for a futuristic production-management system based on predictive analytics and where algorithms optimize throughput to balance costs and demand. Henderson outlines some of the problems inherent with current systems, such as the development of production schedules that do not account for machine downtime for preventive maintenance. Instead, he envisions seamlessly connected data systems (sales, design, supply chain etc.) helping to govern production schedules. And, sensors monitoring equipment health to help direct maintenance operations and predict potential disruptions. Data systems will then notify suppliers ahead of time so they can prepare to meet changes in demand. 3D Metal Printing Experience and Tech Tour attendees will be able to interact directly with industry experts, learn about the latest technology developments for 3D metal printing and hear case-study applications for 3D metal printing. They'll also participate in exclusive plant tours to engage with company representatives and view 3D metal-printing machines in action. The latest in metalforming and fabricating products and technology. 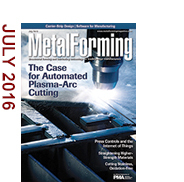 Automating the plasma-arc-cutting process makes sense for fabricators that repeatedly make the same cuts, have a high degree of rework with manual operations, struggle with poor fitup and need weld-ready parts. Gas mixing at the cutting head, to practically eliminate purging between setups; a high-speed swirling assist gas that produces nearly perfectly square cut faces; and the ability to cut stainless steel with oxidation-free edges have led this fab shop into the next generation of plasma-arc cutting. CNC Machinist-Weekend Shift (IA) / Geater Machining & Manufacturing, Co.